Since vSphere 4.1 VMware has enabled Active Directory integration for ESXi into the GUI. This is a nice feature to elevate your security and make sure that your AD can be used for authentication on the ESXi host. 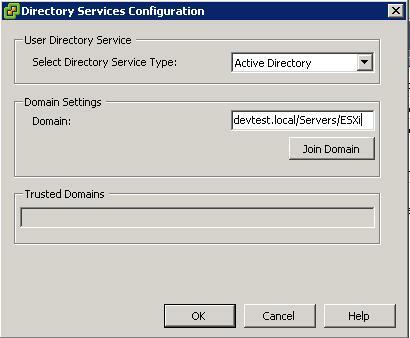 You can configure the directory services in the GUI by accessing the Host Configuration –> Authentication Services and then clicking the Properties. A configuration box will pop up and it will ask you for the properties for your Active Directory service. Note ! If you want your ESXi host to be put into a specific directory in your Active Directory you’ll need to put the OU directory structure after the domain name. In my case devtest.local/Servers/ESXi in which the ESXi hosts reside in directory ou=Servers,ou=ESXi. Next you will be asked for domain credentials (please use account@domain.suffix) with privilege to join computer account to the domain.The right credentials will add your ESXi host to Active Directory. Thanks for sharing. Didn’t know about the specific OU thing. OU=Servers,OU=ESXi,DC=devtest,DC=local (the Servers OU resides in the ESXi OU)? From a ESXi perspective it’s devtest.local/Servers/ESXi. For that reason I chose to name it OU=Servers,OU=ESXi. Not correct in an LDAP way, but correct to explain it in an ESXi domain join. So the ESXi OU resides under the OU Servers. Sorry for the confusion.